Mumbai, January 17, 2017. 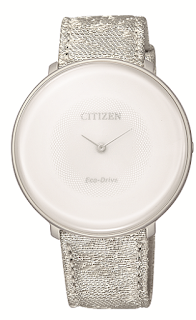 CITIZEN WATCHES (India) presents elegant Limited Edition Eco-Drive watch from Citizen L Ambiluna Collection for ladies. This artistically crafted timepiece is an embodiment of panache, opulence and technological mastery which are hallmark of CITIZEN Collections. CITIZEN Eco-Drive EG7000-01A is a beautiful watch tailor made for contemporary, confident and elegant women. It is set in a Super Titanium™ case with silver toned Nishijin bands which perfectly complements it. It is powered by CITIZEN’s Eco-Drive technology which ensures no battery replacement. Made with water resistant technology of up to 50 meters, this watch is for women who are not afraid to make a style statement. 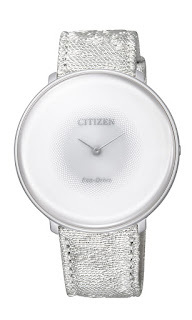 This watch is retailed at CITIZEN’s exclusive stores and multi-brand outlets across the country. CITIZEN Watch is a true manufacture d'horlogerie with a comprehensive manufacturing process that extends from creating a watch’s individual components to its final assembly. The company operates in more than 100 countries around the world. Since its inception in 1918, CITIZEN has held the belief of “Better Starts Now” — that is, no matter who you are and what you do, it is always possible to make something better, and now is the time to start doing it. Sharing this belief, we have made watches, invented and improved technologies and explored the future of watches such as our proprietary light-powered Eco-Drive technology, which originally debuted 40 years ago, and state-of-the-art satellite-synchronised timekeeping.